Remember these from Friday?! We'll have to go back sometime to see how they made these! Please video record yourself saying your speeches. You can use a tablet or a phone, but please videotape yourself giving your speeches. These are the speeches that were due a couple of weeks ago. Everyday: Please do your Spelling. 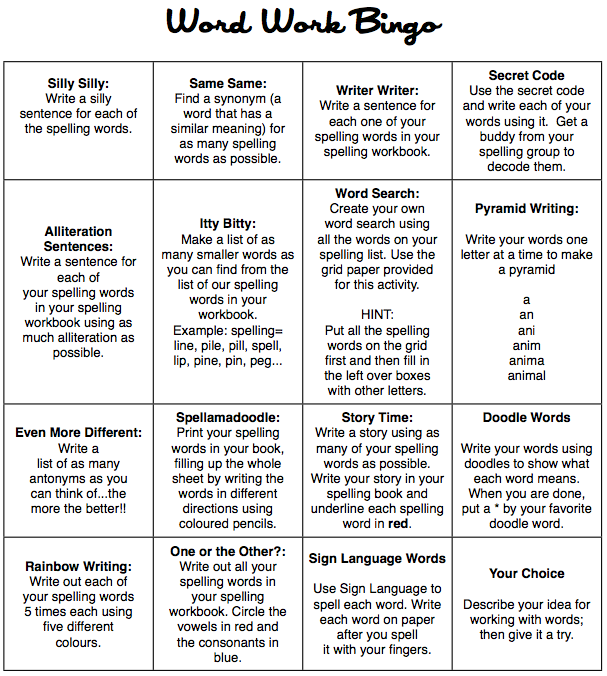 You don't necessarily have to do the activities on the computer, but you DO need to complete your three BINGO card activities in your Language Arts notebook. Please take the test when you are ready. Remember, you don't have to know every word by heart to feel "ready" -- if you can read the words and spell them correctly out loud, you are probably ready to take the test! :-) Love you all! Please write two (2) fables. Remember fables have animals or people as characters, and the story must teach a lesson. Write what the "moral" of the story is at the end. Flashcards! Please practice your multiplication flashcards. Also, go to YouTube.com, and search for "Count by ____" -- fill in the blank with numbers 2-10. Example, Count by 5 -- it will bring up videos of songs that will help you learn how to count by 5s. Learn at least 2 songs. :-) Feel free to put movements to the songs! ​Please write two (2) fables. Remember fables have animals or people as characters, and the story must teach a lesson. Write what the "moral" of the story is at the end. ​Flashcards! Please practice your multiplication flashcards. Remember a factor is all the numbers that can be multiplied into a number. For example, multiples of the number 10 are 1, 10, 2, 5. (1x10, 2x5). ​In a Venn Diagram, please compare and contrast the differences between the format of the fable that you copied EXACTLY from the book versus how you wrote it using true grammar rules. What are the differences? Punctuation? Can you still tell what words rhyme? Is it shorter? Write your observations in a Venn Diagram. You were reading about Babysitting and taking care of others. Please find a certain task you learned (like how to change a diaper, or how to make a bottle, etc. ---- Those are just examples. I didn't read the book, so pick something from the book that you learned how to do.) Then write a "How To" speech. Use words like, "first, next, then, last, etc." to teach us how to do that task. Then create a manual with pictures on how to do the task. If you don't understand this, please call me. CLICK HERE for a larger version of the below BINGO card.